Some folks just get going and their enthusiasm grows. Roman and Melissa started with a vintage model imported from back east and now have a brand new FB model. They even have Melissa’s Dad in a B-Van so they can go Airstreamin’ together. What more could you want? Only on when needed and using high efficiency LED’s is how you can balance between needing to see where you are going with a minimal impact on your electrical energy storage capacity. Harbor Freight has a sale on their LED motion sensor light. Six bucks and four double A batteries will purchase a nifty light that you can use near your door to light the steps if anyone comes to visit. WinTron also has a similar motion sensing, battery operated, LED light. Theirs is $16. WinTron used to have an AC/DC version (and a whole lot of other nifty stuff). You can set these lights for always on or to be on for 30 seconds when they detect motion. That makes them useful for bathroom night lights in the RV or for other places where you need to see where you step but don’t want a light always on. An early spring rally just north of Reno. Some sunshine and flowers, lots of mountain and valley views, some wind (a lot of wind), and even some snow. This is a good way to check out all of the RV systems! It is one thing to get the rig level (see Parking on grade, like at Ft Sage or Unionville) but you should check more than just the bubble. Anita suggests that you always check the door to make sure that it opens and closes properly before being satisfied with your setup. If the rig is tweaked – one corner is jacked up a bit more than the others, you will find this out if the door doesn’t open like it should. It might stick and be difficult to open or close. If that’s the case, you need to make some adjustments. raise the stabilizers and check the door to see if one of them was doing more than just stabilizing the rig. 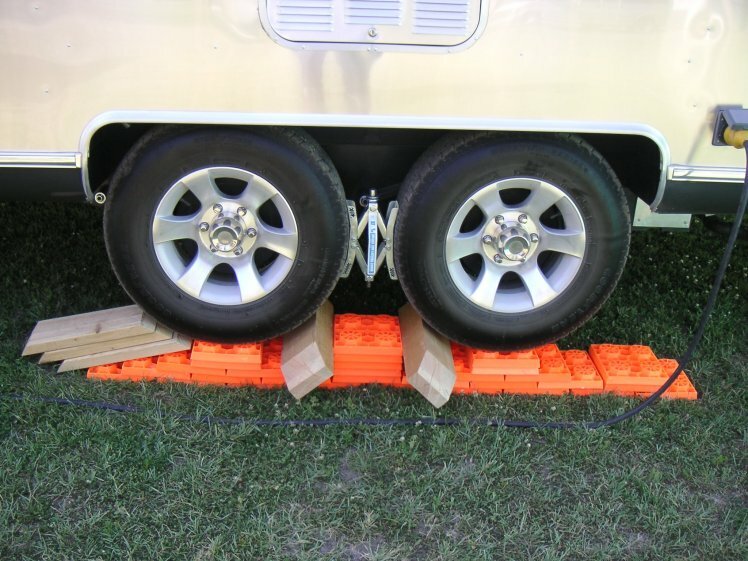 Check the blocks under the tires to make sure both axles have equal support. Once you have the entry door so it will open and close properly, check the closet and refrigerator doors. They usually won’t suffer from a slightly tweaked frame. What they will do is to swing shut or swing open once you open them if you aren’t reasonably level. It is no fun going camping when you can’t get into or out of your rig because the door is tweaked. It is also a nuisance to have to keep interior doors from slamming against something because they want to find the low side, either. Check your doors as one way to tell if you have the rig set up right! Out near Gene’s place in Mogul the earth is slipping. The resultant shaking has folks storming their insurance agents to add earthquake damage to their policies. The Nevada Seismological Lab has a special page for the West Reno Earthquakes where you can find out about the latest shakes and report what you felt. The earthquakes are getting noticed in the news worldwide. See Another large earthquake rattles Mogul , Verdi for the local paper report, The NSL PSA, The free republic posted the automated report followed by some discussion of those who felt it, Sign on San Diego reports on unusual features of the earthquakes like how shallow they are and the increasing magnitudes,. Most stories report on the shaking and earthquake preparation and human reaction. It is difficult to find much about the geology behind this particular swarm, perhaps because it takes a bit of time for that to percolate out of the data. In this case, it appears to be a strike-slip fault on or near the surface. This is a bit different from the usual Basin and Range province or Sierra Fault geologic action that makes to road grades on the east side of the hills usually greater than those on the west side. The road out to the Fort Sage trail head is a couple of miles of dirt, sand, and washboard. Travel on that type of road can vibrate nuts and bolts and other things loose. A potential result is something falling off or coming apart all together. An example is the holding nut for the stabilizing jack. Here’s what happened at the end of the April rally. When it was time to lift the jacks, this one didn’t. What was going on? Time to crawl under the rig and take a look. Well… that makes some others curious so they have to see what is going on, too. Pretty soon there is a convention down there a hemmin’ and a hawin’ about what went wrong, what needs to be done, and how to fix it temporarily until a proper repair can be made. At this particular rally there were a number of these assistance committee gatherings – rather typical of a spring rally as the equipment is hauled out and everything tested for a new season. MFRV needed to replace a 20 amp fuse for the furnace – Dave had one. Norman needed some instruction on how to fire up the furnace on his new B-Van. Michael needed a level and some blocks to get his rig livable. Jerry had another episode in his ongoing Moen faucets saga. — little problems, big problems, – no big deal with a bit of help and assistance! Rich takes note about the need to perform a “sanity check” on the driving directions you may get from automated navigation systems in South Llano River State Park. Sharon’s predicament brings up a cautionary note. The Garmin GPS that we and many others use is a great tool – most of the time. But you have to sanity-check it, especially when getting off the highway and going to state parks. The GPS is programmed so that it will choose either the quickest (time) or shortest (mileage) route. This means it will send you down a bumpy dirt road over a one-lane bridge if it calculates that this will shave 10 feet or 10 seconds off your overall trip. That’s what it did to Sharon. Her GPS said to turn left, and she found herself facing a dead-end that wasn’t in the GPS database … at night … with no one in the truck to help her. She tried to back up in the dark alone and met a tree, which left her with $12,000 worth of aluminum damage and an enforced two-week stay here at South Llano River State Park. There are many stories about blindly following automated navigation system instructions and getting into trouble. Whether it is the turn onto railroad tracks or a route into a lake or a suggestion to take a road too small for a big rig (Great Britain is now posting warning signs for truckers because of this), it pays to qualify the instructions you get. The mapping companies are adding information to their databases to help with parts of this problem. They allow users to add comments to routes for others to see and sometimes even have explorers cruising routes to garner pertinent precautions. But that does not consider how things change over time and the potential problems of the accuracy of navigation systems. Perhaps the first qualification to consider is the source of your instructions: are they from someone with a rig like yours and a sense of caution like yours who has ‘been there, done that’? How long has it been since the source of the instructions has last seen the route? Did they see it directly or just look at maps, satellite pictures, and DOT websites? The quality of the instructions is only the first part of arriving safely at a destination. The other part is paying attention as you go. You need to be on the lookout for any signs that you may be heading for trouble. You need to always plan for an ‘out’ so you can remove yourself from ticklish situations. You need to consider alternate routes in case one doesn’t work out. The bigger your rig and the less experienced you are, the more important it is to play it safe. Don’t just take someone’s recommendations for granted. Always qualify the instructions and be prepared to modify them so they are sane and appropriate for your needs and preferences. When you decide it’s time to park the rig and level it out, you’ll often find that the grade can be deceiving. At Fort Sage, the parking area is estimated to have a grade of 4% or so – about half the limit allowed for freeway construction. Fort Sage – note how low the noses are! At Unionville, the grade might approach freeway max. That makes for some interesting leveling jobs. One way to tackle the leveling problem is to figure the best orientation. You want minimal lift yet you also don’t want the door to get so far off the ground it is difficult to get in and out of the rig. 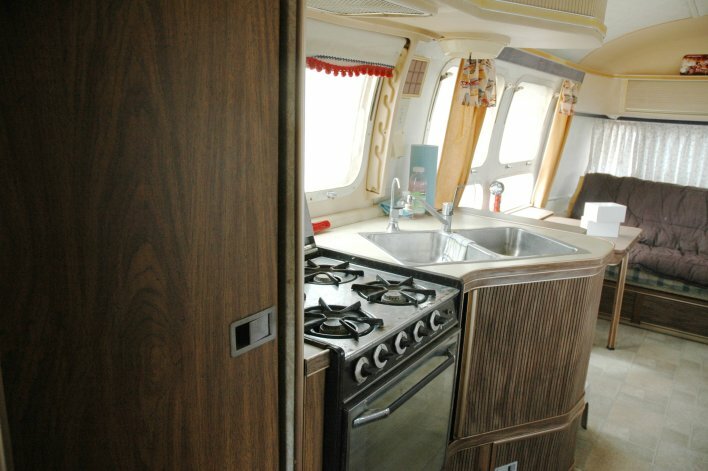 On a 1975 Airstream 29′ Ambassador trailer, the distance between the wheels is 80″, the rear overhang is 110″ and the front overhang is 190″. This means a 4% grade represents a distance difference of 3.2″ between the wheels or 4.4″ at the rear or 7.6″ at the front. At a 6% grade, the distance differences would be 4.8, 6.6, and 11.4 inches. Or, for side to side considerations, a 2% grade needs one Lynx Leveler pad, a 4% grade needs a 4×6 piece of lumber and a 6% grade is going to need a 6by board. If that 6% grade is going front to rear, the tongue jack will be pushing its range. If the tongue is uphill, the hitch is on the ground. If the tongue is downhill, the jack has the front lifted nearly a foot past the usual 8 to ten inches, which is nearing its limits for extension. Whenever you are parking on a grade, keeping the rig from rolling downhill is a big concern. It is very difficult to get chocks that work at steep angles or at significant lifts. You never want to trust just one solution either. You can see how several boards were used both downslope and between the wheels in the Unionville picture. 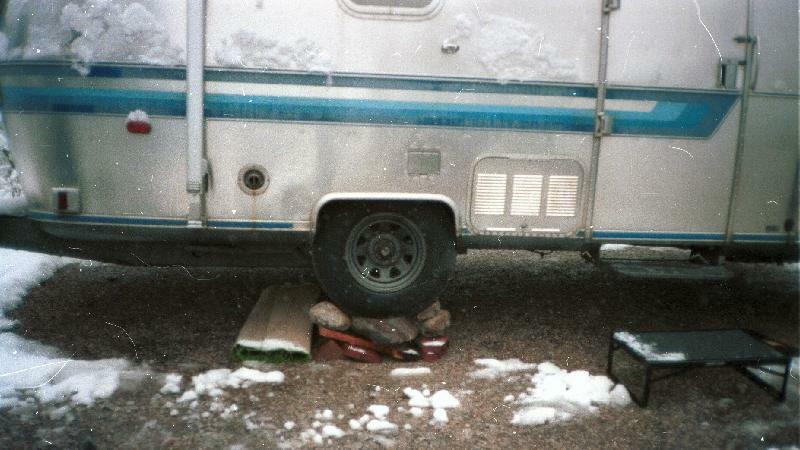 In addition, between wheels stabilizing chocks and the stabilizing jacks at the trailer corners were also used. Another consideration is wobble and possible falling off of jacks. This is a reason why it is preferred to have the tongue down hill. For front entrance trailers, a low tongue will not only help stability but also help keep the door from getting too far off the ground. Owner’s Guide page on leveling your rig. There are a couple of new photo galleries up! Both provide a tour of an Airstream Trailer. now here’s the view of the inside of a new one! * Note: Links to photo galleries and additional information mentioned in articles in this newsletter can als be found at that link. The Long Range Planning Committee of WBCCI recently sent a survey to each Unit. We need your input via email, snail mail or phone by April 21, 2008. For a copy of the survey go to. 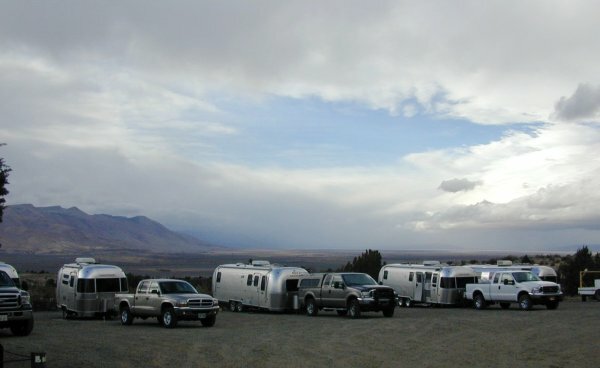 http://sierranevadaairstreams.org/snu/members/08ap-wbcci-survey.html. The campground is near Doyle, CA, about 45 miles north of Reno and about 5 miles east of US 395. 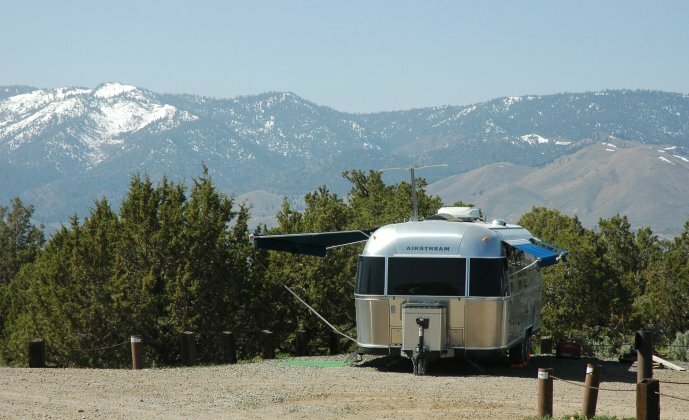 There will probably be an informal day trip to nearby Portola to check on the 42ft Airstream. Bring firewood for all day campfires. If you can’t make it for the entire time come on out for a visit anytime during the weekend. Some of you may have trouble with embedded links in a PDF file. Sometimes the links might change. You can find all the current links on the newsletter index page. It looks like it will be (even more of) a mess if you plan to go through Sacramento this summer. A note on the Escapees Forum linked to the CalTrans site for the Fix I-5 project. This is a reminder that you need to check DOT sites and do some I’net searching before you travel this summer. Road construction can really bolix up travel plans, especially when they close major freeways for a month. Fortunately, with websites like Fix I-5 project it is getting easier to tell when and where the construction will be in progress so you can plan alternative routes. The post Understanding batteries, start with these links will set you on a path to learn anything you might want to know about your RV storage batteries. But if you just want to know what it all boils down to, here are a few rules of thumb that may serve as a guide. 1) buy batteries intended for the way you plan to use them from a retailer who sells a lot to folks that use them like you do and will stand behind what he sells. 2) cycle your batteries down at least 10% to no more than 50%. For a 12v system this means the battery voltage will be between 12.4v and 12.0v after resting for at least a half hour with no loads or charging. This makes sure the batteries get proper exercise to stay in good condition. 3) plan on about 1 pound of battery for each 10 watt hours of energy you need for a typical 3 day weekend. 4) always recharge your batteries promptly, properly, and vigorously with a 3 stage charger rated to provide about 20 amps for every 100 amp hours of battery. 5) never let batteries sit without a full charge. 6) if not using your batteries for more than a couple of weeks, use a battery maintainer that will keep them fully charged and apply techniques that inhibit sulfation. Modern RV use can be rather hard on batteries. There is often a one or two amp constant load to run the refrigerator control board, the alarms, and other resident loads. This is enough to run down a typical group 27 sized RV storage battery in a matter of three or four days. Watching a DVD movie in the evening can take 150 watts for three hours. That 450 watt hours needs about 45# of battery (guideline 3 above) which is near the weight of a group 27 battery. That current drain is also a steady drain at about twice the rate at which the battery capacity was calculated. Those two factors add up to reduce expected capacity another 20% or more. Just sitting out of use is also hard on RV batteries. That is why devices like the BatteryMinder or the Progressive Dynamics converter with the Charge Wizard or the WFCO converter work well (links to Best Converter sales pages). These all keep the battery full charged and the electrolyte mixed to inhibit sulfation and sulfation is the major cause of death for RV batteries. 7) let your own experience be your guide. 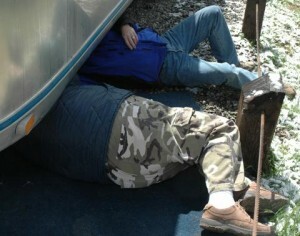 If you keep running down your batteries either enlarge your battery bank or change your RV lifestyle. If your batteries don’t have the life you expect (5 years or so for the typical RV battery in typical use) then change how you use and maintain them. There are many posts in this blog about batteries (link to search results). Some folks get obsessive in watching and worrying about their batteries. It can make a nice hobby but don’t let it get to you. See the posts on hydrometery and measuring battery status. If you let experience be your guide and just keep an eye on the resting voltage, you can do well enough. 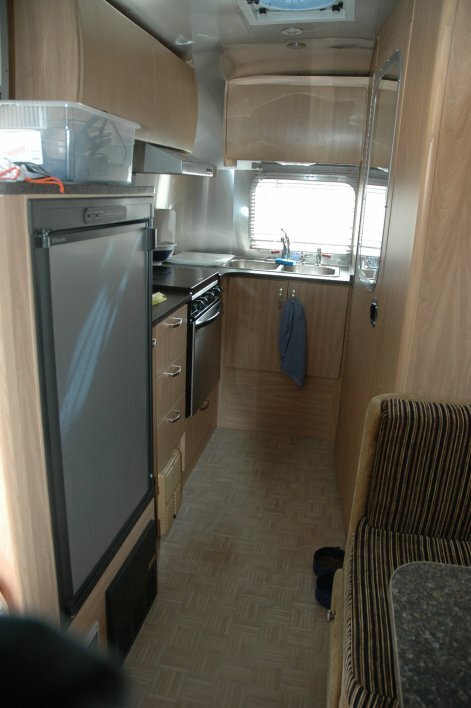 That means you can put your attention to enjoying the RV experience without excessive worry about the RV systems. There is a lot of information out there about lead acid batteries. Here are a few websites that you can use to learn about this well established technology, how it works, and where it is going. As always, exercise critical reading and thinking skills. Some of these pages have errors, some have assumptions that may not work well with your interests, some simplify things in ways that may mislead – that is why you need to be careful about what you get from your research. operation and construction – Nuclear Power Fundamentals? but really, a good rundown on the chemistry with diagrams showing plate construction. Battery Basics A good rundown on the basics that isn’t too technical from the maker of one of the better RV converters. The Basic Chemistry of Gas Recombination in Lead-Acid Batteries – this is about the sealed batteries that first appeared in the 1970’s and how they work. Battery Basics – fireflyenergy.com – You might have to dig a bit here as this website for a new battery technology project is quite active. The focus is on explaining the current technology as a reference for their new one. lead acid batteries, battery history types and development – solar navigator world electric navigation challenge, nelson kruschandl, bluebird electric land speed record cars – the focus here is on solar systems so be careful about context as the range they discuss is much broader than that normally found in the RV community. Battery Modeling for HEV Simulation by ThermoAnalytics Inc – if you want to make a mathematical model of your battery, this is one place to start. The ABCs of AGMs. (PDF) – some nice pictures and a lot of good advice about this battery technology and how to get the most out of it. Batteries – University of Hawaii amateur radio enthusiasts explain how batteries work. Batteries – fundamental theory and concepts. Car and Deep Cycle Battery FAQ, Battery Manufacturers and Brand Names List, and – the BatteryFAQ.org entry page with links to several documents. Az Wind Sun Battery FAQ They call it the “The Ultimate Deep Cycle Battery FAQ” and it isn’t bad … but, again, be careful of the broader scope of the solar alternative energy bias. Pacific Power Batteries – About Automotive Batteries – this one has some good stuff to look for if buying a battery. deep cycle battery frequently asked questions – this one is a bit more technical and has some good diagrams of construction and charts for temperature effects and other phenomena. Car and Deep Cycle Battery FAQ – part 16 of the BatteryFAQ.org documents about how to revive a sulfated battery at RPC. Exide Technologies FAQs – Marine & RV Batteries – takes some liberties to simplify things but covers some good topics. Battery Tutorial | Batterystuff.com – some good information about why batteries fail and a nice chart of specific gravity and voltage as a function of state of charge. DIFFLOCK.com – Battery Guide – This is another page found copied in several places. Do check the section on how to determine the date of manufacture for batteries. what do i look for in buying a new battery? A part 7 FAQ copy. battery criteria performance ranking chart (PDF) – Flodded, AGM, or Gel, which is best? As with any rating, the key is to figure out what is actually being evaluated. This PDF has a nice rating chart and a page defining the criteria that may give you an idea about what to think about when buying your own batteries. Batteries — and Other Electric Stuff by phred – some good tips for your RV battery use and maintenance. Battery Desulfation – Projects – build your own! Learn about what it is and what you can do about it. Aviation Battery Plate Sulfation and Resultant Degradation Explained – “Battery Plate Sulfation For Us Dummies” some good stuff on charging and maintenance, too. Battery Maintenance InformationHow to keep your golf cart batteries from going dead over winter – some lessons for the RV, too. Exide :. battery servicing tips – page load error? you try it, maybe they have it fixed again. Preventive Maintenance, Charging and Equalization info – if you are really into the hazardous realm, here is the manual for the hydrometry enthusiasts and bona fide equalizing community. Again, solar and alternative power oriented and not so much for the Rver except as a reference. The care and feeding of solar batteries by Jeffrey Yago, P.E., CEM Issue #95 – the top half is ‘why’ and the bottom half is “how” to maintain your batteries properly – again, an alternative/solar bias. Notes on Batteries – a Peukert calculator and how to figure batteries in serial or parallel. 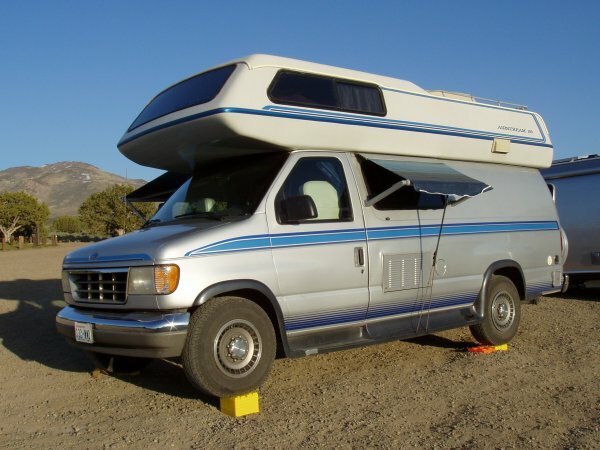 RV Camping with Solar Power – this is a ‘HowTo” for those thinking about engineering a solar system for their rig. His use profiles include amateur radio field days and star parties. Battery charger and battery analyzer experts – Cadex Electronics Inc. – describes the kinds of battery tests that can be done. Battery-Web.com – Battery Tester FAQ – they are selling their gadget and present an interesting viewpoint of battery technology in the process. Conductance Questions and Answers (PDF) – Midtronics has this effort to help you understand how these battery testers work. Using conductance technology to ensure battery system reliability (PDF) – this is an industry white paper. Battery Testing Using Conductance Technology for NSB Series Valve …(PDF) – Northstar Batteries starts with a simple circuit model to describe how conductance testing works and some nice graphs about what happens when using conductance testing properly. Battery Testing Using Conductance Technology (PPT) as an aid to determining replacement strategy. The slides in this presentation have some good meat and reference a lot of other material on the topic. Advanced battery analyzers starts with “What is the difference between CCA and RC?” and helps you understand how that question is a key to learning about battery health. conductance testing questions and answers – more questions answered based on the Midtronics sales effort. Bogart Engineering: manufacturer of the PentaMetric battery monitor which measures volts, amps and amp-hours for battery systems used in homes, RV&apos;s and boats. Xantrex Technology Inc. – Boats – Link 2000 & 2000R – Product Information – a popular net energy meter for use with their inverters. Xantrex Technology Inc. – Link 10 – Product Information – a popular battery monitor. Digital DC Ammeter, Amp, Watt Hour, Battery Fuel Gauges & Meters – more ways to measure your battery parameters. Electric Vehicle Battery Information – like he says “Get the Coffee! It’s an all-nighter.” – the page is a gateway to a lot of battery information. This is a good resource if you want to see what else there is besides the lead acid battery. Power Technology, Inc., PWTC, New Battery Technology – this and the Firefly project look to be two significant advancements in storage batteries that might be applicable to RV’s. You’ll need to browse the site to find things, though. Look for the ‘technology’ link in the menu. www.happy-wanderers.com – a 6v series vs 12v parallel treatise that promulgates a few myths. See if you can find them. AGM Toch Battery Power for Solar and Wind Power Systems – pros and cons from an AGM manufacturer. Remy Battery(PDF) – these guys had a good PDF on sla and gellcell maintenance but it appears it moved. Check the site and you might find some other interesting educational nuggets. Batterytender.com – Home of All Your Charging Needs – Their Introduction to Lead Acid Batteries is a good rundown on the basics. They sell a battery maintainer and desulfator that has a good reputation. Car Battery and Deep Cycle Battery References & Information Links – Bill Darden provides links to a lot of manufacturers for various things battery. lead acid battery charging – explains charging stages and voltages. Tech Talk: Battery Maintenance – another moving link at Interstate Batteries. Hopefully you’ll find a page with links to good stuff. USMC lead acid battery training (PPT) – for some reason this one causes Open Office Presentation to abort. It was a good training presentation when last viewed. Also check the Understanding section of the Owner’s Guide for pages on batteries, configuration, energy, and power. One of the more contentious, yet important, laws about the behavior of batteries is explained in the page Understanding the Peukert Effect. Again, read carefully and don’t just take what you find ‘as is’ – learn about what is behind the conclusions and what peculiarities of measurement are behind the assertions. Boil it down to something that makes sense and can be useful. The American Heart Association has updated their recommendations about what to do when someone has heart failure. There is a new website, Hands only CPR that tells you what to do. 2) Push hard and fast in the center of the chest. Studies of real emergencies that have occurred in homes, at work or in public locations, show that these two steps, called Hands-Only CPR, can be as effective as conventional CPR. Providing Hands-Only CPR to an adult who has collapsed from a sudden cardiac arrest can more than double that person’s chance of survival. The mouth to mouth breathing thing has not been found to be very effective so chest compression only is the new standard. See the FAQ and resources on the website and learn more! The California Highway Patrol announced this week that towns around the state will introduce a completely new kind of vehicle checkpoint. Officer Oliver Brownstain, an agency spokesman, explained that officers will conduct intelligence tests of drivers and confiscate the keys of drivers who fail to pass them. The checkpoint will be set up along the busiest sections of road in each city and could entail delays of up to 90 minutes for each driver, depending on how stupid they are. We all know how much better it would be if we could get the stupid drivers off the road and out of our way!